Members of the Southeast Alaska Panhandlers Motorcycle Club rumbled their way up to Bartlett Regional Hospital on Friday, hundreds of toys in tow. The toys were the result of the club’s 24th annual Toy Run, during which members of the club ride through town and collect toy donations at the Douglas Fire Station. Justin Papenbrock, the secretary for the club, said they didn’t have quite as many riders as usual this year due to weather but that didn’t dampen the spirits of people looking to donate toys. Her real name is Kattathu Johnson, and she’s a U.S. Army combat veteran from Houston at her first Sturgis Motorcycle Rally in the Black Hills of South Dakota. Johnson, a member of the Wounded Warrior Project that helps veterans find peace through “motorcycle therapy,” earned her nickname in an unusual way. Mile after mile on her way to Sturgis last week, riding a Honda 750 Shadow in a tight group with other veterans, she didn’t realize her left turn signal was on. It was Johnson’s first long motorcycle trip since she got into biking a year ago, and she was so engrossed in the beautiful scenery, the soothing rumble of the bike engines around her and the camaraderie of veterans, that she didn’t notice her bike’s “blinker” never shut off. CLEVELAND, Ohio -- A man is charged in connection with the shooting that killed a man in the doorway of Satan's Sidekicks motorcycle clubhouse in the city's Collinwood neighborhood. Armand Green, 25, is charged with aggravated murder in Sunday's shooting that killed Mario King, 34. Green is not in police custody and a warrant was issued Tuesday for his arrest. The shooting happened about 4 a.m. Sunday at the motorcycle clubhouse on East 140th Street, south of Aspinwall Road. The clubhouse, in a former BF Goodrich building, is not marked and has signs that say "Member's Only." Green and King argued at the clubhouse and both men pulled out guns and fired shots at each other, according to police and court records. Police found King dead in the doorway with multiple gunshot wounds to his head, neck and upper body, according to the Cuyahoga County Medical Examiner. It is unknown if Green was injured in the gunfire. 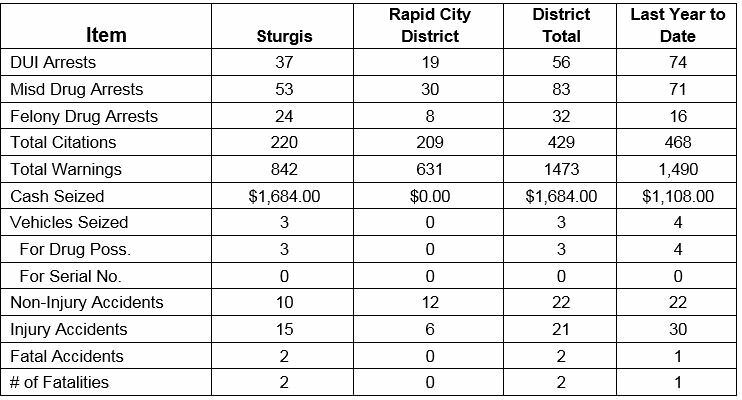 (lots of pics) --- Drug arrests are up and injury accidents are down from last year, according to Tuesday's statistics from the Sturgis Motorcycle Rally. Thirty-two people have been arrested on felony drug charges this year, as opposed to 16 this time last year. 83 people have also been arrested on misdemeanor drug charges, as opposed to 71 this time last year. While there have been 2 fatality crashes so far during the rally, there have been only 21 injury crashes this year, compared to 30 last year. Both fatal crashes occured on Saturday. (photo gallery) --- STURGIS, South Dakota – The rumbling of thousands of v-twin engines says one thing: The annual pilgrimage known as the Sturgis Motorcycle Rally is officially underway. The 78th rally — it was suspended during World War II due to gas shortages — is the world’s largest motorcycle event, drawing visitors from around the globe for 10 days. An estimated 500,000 people will participate in the rally that runs through Aug. 12. At the time of the 50th anniversary of the Warsaw Pact occupation of Czechoslovakia, the motorcycle club is becoming active as part of Russian hybrid war, the call reads. More than two hundred public figures have urged President Andrej Kiska, Speaker of Parliament Andrej Danko (SNS) and Prime Minister Peter Pellegrini (Smer) to take action against the Russian Night Wolves motorcycle gang, which has set up a base in the village of Dolná Krupá (Trnava Region, western Slovakia). The public figures who signed the document find the activities of the Night Wolves in Slovakia scandalous. CRAWFORD COUNTY, Mich., (WPBN/WGTU) -- A northern Michigan man faces a long list of charges after a report of a crash in Grayling. Officers from the Grayling Department of Public Safety were called to Spike's Keg O' Nails on Saturday, July 7 for a three-vehicle crash. While officers were responding, dispatch advised that the vehicle was continuing to crash into other vehicles. When they arrived on scene, officers found the driver, and sole occupant of the car, to be a 64-year-old Cheboygan man who is a member of the Northmen Motorcycle Club. Investigators said the man was in the area for a club meeting in Frederic. With the 50th anniversary of the Warsaw Pact invasion to rein in then-Czechoslovakia quickly approaching, one of the Kremlin's boldest advocacy groups has set up a military-style "camp" outside the capital of NATO member Slovakia. The Night Wolves motorcycle club, whose members were at the vanguard of Russia's occupation of Crimea and nicknamed "Putin's Angels" by the media, has taken residence at a former military base in Dolna Krupa, about 60 kilometers northeast of Bratislava. The move by the club, known for promoting Russian nationalism, hatred of gays and feminists, and allegiance to the Kremlin, appears aimed at revealing a dark, anti-Western side of the European Union member, which has sizable far-right and Russophile elements. The group, which has been hit with sanctions from the West over its support for pro-Russia separatists in eastern Ukraine, was established in Slovakia last month.